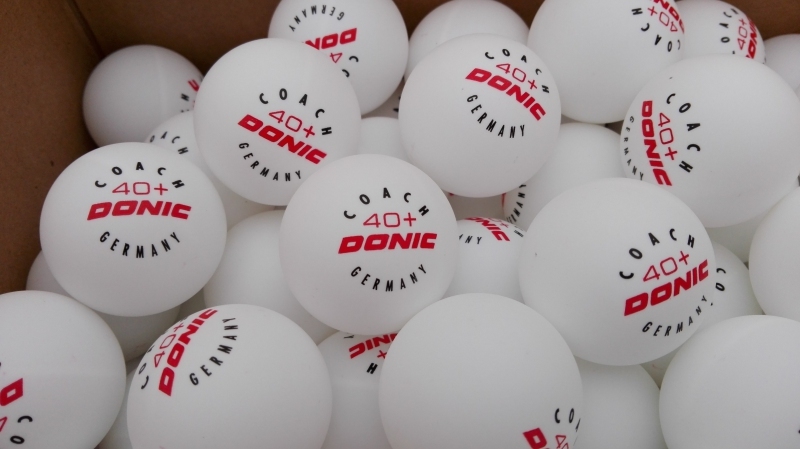 Having a big box of table tennis training balls is useful if you are serious about improving. In this article I explain why it’s useful to have a box of training balls and give recommendations about which training balls you should buy. So what’s the point of having a big box of table tennis training balls? Surely a couple of balls is enough? I mean, you can only play with one ball at a time, right? If you just play for fun, then you don’t need a big box of balls. You can keep using the same one or two balls until they eventually crack or get trod on. If you only have one ball when you are doing training drills, you’ll spend as much time (probably more) just picking the ball up from the floor. It can be difficult getting into a rhythm with drills if you have to keep stopping to pick up the ball from the back of the playing area. But if you have a box of balls, you will spend much more time actually doing your drills. When someone messes up the drill, no problem. You don’t need to wander off to get the ball back, just get another ball from the box. If you train for an hour, you will hit the ball a lot more, which means you will improve faster. If you have a box of balls, you can vary your training methods. You will be able to do multi-ball training with your partner. This is where one player feeds the balls to the other player in a regular or random sequence. Here’s a video example. All professional table tennis players will use this method of training. It’s a great way to improve, as you can work on your technique, footwork, spin, speed, power, recovery and fitness. But you do need a lot of balls to do multi-ball training. Having a good service game is vital on table tennis. And there’s really only one way you can get really good at serving, and that is a lot of solo service practice. Service practice with one or only a few balls is not the best use of time, as you will spend more time collecting your balls than actually serving. But with a big box of balls you can really get into a good serving rhythm to improve your existing serves and also experiment with different variations. How many balls do you need? In general, you get 60-72 balls in a small box of training balls and 120-144 balls in a big box of training balls. 60-72 balls is actually plenty, but I recommend getting a bigger box or two smaller boxes. The main reason is that when you use lots of balls for drills or do multi-ball training, you will have a few casualties (mainly the balls get trod on). So one box of 60 balls can soon whittle down to 40-50 balls, which is getting a little bit low. Having 100+ balls and topping this up occasionally works very well. What quality balls should you get? In an ideal word, you would train with the same quality balls you play competitive matches with. But using a big box of competition quality balls for training is quite expensive. And if you play at an amateur level, I don’t think it’s necessary. There is a lot of decent quality training balls available (recommendations below), which are much more affordable and perfectly decent for doing training drills, multi-ball and service practice. A word of caution – please avoid getting really, really cheap balls from unfamiliar brands. These tend to be very bad quality and bounce / move very differently to better quality balls and break more easily too. If the price seems to good to be true, approach with caution. Finally, if you’re in the UK and not fussed about whether your training balls are celluloid or the new plastic material, you should consider Cornilleau Pro Table Tennis Balls. I used these for many years (less so now). These are good quality celluloid training balls. You can buy 72 balls for a really good price and they are very durable. I have balls which are three or four years old and have been hit thousands of times and they still haven’t cracked. Where can you buy table tennis balls? You can sometimes find quite good deals for table tennis balls on Amazon (UK site | USA site), so worth checking here too.